29. 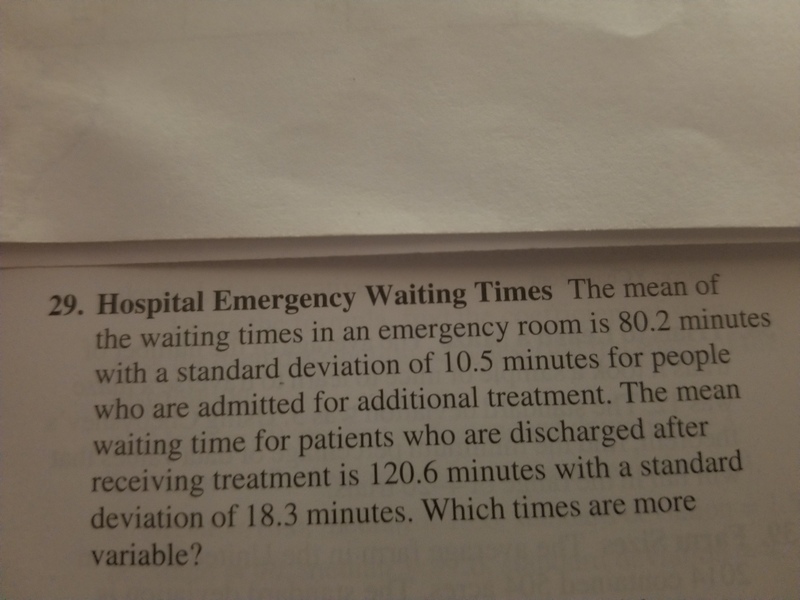 Hospital Emergency Waiting Times The mean of the waiting times in an emergency room is 80.2 minutes with a standard deviation of 10.5 minutes for people who are admitted for additional treatment. The mean waiting time for patients who are discharged after receiving treatment is 120.6 minutes with a standard deviation of 18.3 minutes. Which times are more variable? The measure of variability or the measures of dispersion can be measured using the statistics range, interquartile range, standard deviation and coefficient of variation. Among these 4 measures of dispersion, coefficient of variation gives the variation in the data set relative to its mean. Hence, coefficient of variation is said to be best measure of variability.